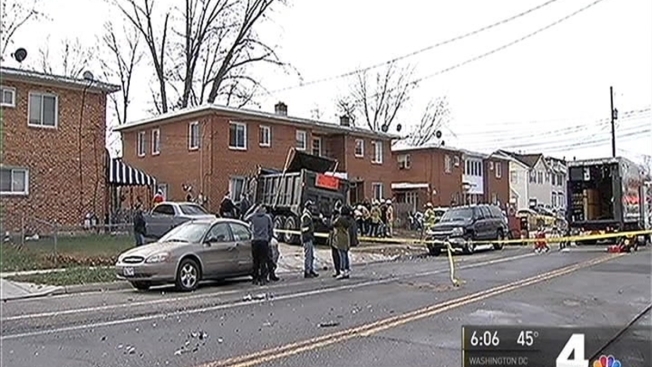 Medics are evaluating four people, including two children, after a dump truck collided with several vehicles before crashing into a house in Prince George's County, Maryland. Larry Clark, the driver of the truck, said he was struck by a white truck, causing his front wheel to lock, which caused him to hit other vehicles before crashing in to a house in the 900 block of Owens Road in Oxon Hill. Some witnesses at the scene said they saw the dump truck traveling erratically before crashing into the house. They didn't report seeing another truck hit the dump truck. Prince George's County Police are investigating the driver's story. The house sustained significant damage, said Prince George's County Fire & EMS spokesman Mark Brady. No one was in the house at the time. Two vehicles the truck struck were occupied. A father and his two children were in one of the cars and a woman was in the other. All four were evaluated by medics. Brady said there are "some injuries." However, the patients' conditions are unknown at this time.